NEVER underestimate a girl from Taiping, so said a veteran pageant queen during my first pageant. These girls may be from a small town, but their fair complexion and never-ending long legs posed a big threat to the other girls. Not only are the girls beautiful, but the food in Taiping is also supposedly good. My makan gang and I decided to check out the food scene in Taiping recently. Our first stop was Wan Li along Jalan Besar, for its Hainanese chicken chop. The place looked rundown, but the kitchen whipped out a mean plate of chicken chop (RM7.50). Crispy and golden brown on the outside, the chicken was topped with savoury brown sauce and served with crinkle cut wedges and vegetables. The meat rolls (RM2.50 each) were also worth trying. Generously filled with ingredients, this was chunky and flavourful. After a satisfying lunch, our next destination was Ansari Famous Cendol, to cool down from the afternoon heat. I don’t know about the rest of you, but I always have my cendol with pulut. The pulut from Ansari was well grilled and lightly chewy – it gave the creamy-sweet concoction a delicious bite. I also enjoyed the red beans, which was fragrant and not overly sweet. We checked into our rooms, freshened up and drove to Kuala Sepetang for dinner. 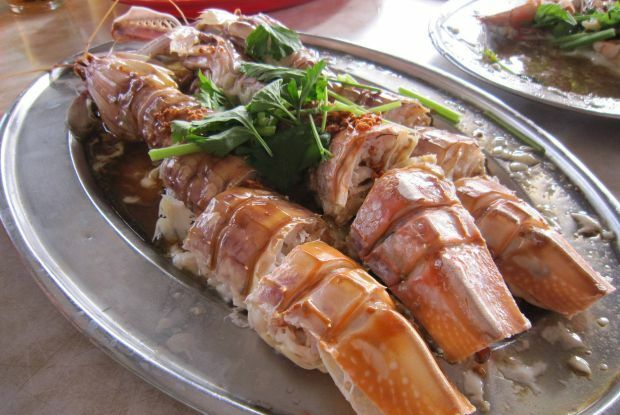 This fishing village is known for its fresh seafood and is about 30 minutes away from Taiping town. Restoran Tepi Sungai is literally right next to the river – the restaurant is on the first floor while the ground floor is a docking area for fishing boats. The five of us had steamed mantis prawns, steamed prawns, Teochew steamed grouper fish, fried meehoon and a plate of vegetables. Granted the seafood was fresh, I thought the cooking method was nothing to shout about. The mantis prawns were crunchy, succulent and beautifully complemented by the rice wine. We were not too happy with the prawns, however, as they were not properly cleaned but I enjoyed the tangy-savoury gravy of the fish, and drank every drop. Since dinner was relatively early, the gang and I were hungry around 10pm. The food court at Taman Tasik Taiping was packed with people having their supper. The meat rolls/lohbak (RM9.60) were well fried, meaty and full of flavour. I also liked the pork noodle soup (RM3.50). The broth was thick and porky with a slight peppery kick. Many people ordered the fried oh chien (RM10.50 – large), carrot cake (RM2.80 – large) and grilled stingray (RM14), so we followed suit. Out of the three, only the stingray was delicious. The oh chien was average tasting while the carrot cake was burnt, wet and under seasoned. For breakfast the next day, we tried the much-talked-about kuay teow th’ng at Kakak Restaurant. Crowded and noisy, I found it difficult to get the staff’s attention. The noodles (RM2.90) were not bad, but not as smooth as the ones from Ipoh. Our order of steamed chicken with beansprouts (RM6) were pretty tasty, but the portion was a tad small for a greedy girl like myself. Skip their drinks (RM1.40) if you can – they were ridiculously sweet and possibly a step to a world of diabetes. Many people suggested that I try the duck rice at Peace Hotel and Coffee Shop. This old-school coffee place was packed with people tucking into platefuls of rice and duck. We ordered half a roast duck (RM20), a plate of fried pork and liver sausages (RM16) and a bowl of choy keok (RM3). I thought the duck was nothing to shout about, but the fried pork and liver sausages were tender, meaty and deliciously addictive. Rounding up our food trip was the Bismillah Cendol, said to be Ansari Famous Cendol’s biggest rival. Taste wise, Bismillah Cendol was slightly better, as it was more lemak (creamy) and not as sweet. If you’re not a fan of creamy desserts, you might like the cendol at Ansari better. Taiping may be a small town, but it has plenty of good food, interesting cultural attractions and yes, pretty girls. I’m looking forward to my next visit, as I have yet to cover a few more places recommended by my readers. If you have any other Taiping recommendations, do let me know.